Plot: The year is 2000AD and a panicked man runs through the back streets of London. He knocks over a metal bin and realises his mystery pursurers will have located him, sure enough a caped humanoid gunman floats into view. The runner pleads for his life but to no avail, the robotic-looking humanoid shoots. Shock: The fugitive is destroyed, its body a mess of metalwork. The gunman lifts up his robotic mask to reveal a human face, and reflects how realistic the factory robot looked. Thoughts: Bladerunner in eight panels, this small Shock delivers its fun tight, fast and unfussy. Ron Tiner, a new name to the prog, delivers a very realistic looking year 2000 London; run down, crummy and not really advanced from 1978, and he pulls off the essential task of making the human look android,and the android human, with a style that reminds of Ron Turner or Ian Kennedy. The story is very compressed and effective, the reveal that it was human hunting a rogue robot is kept to the second page whereas the first has a nice balance between chase and depiction of the pursuer as callous and heartless. 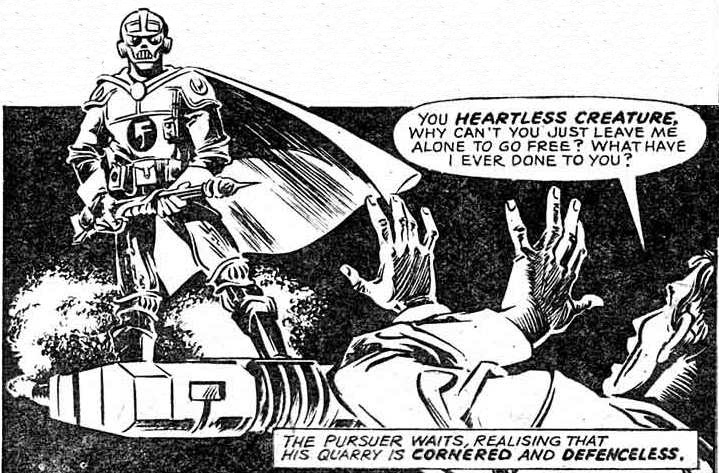 The Shock marks the return to an early theme of Future Shocks, that of ‘mankind’ being the bad guy. Like several of the early Future Shocks the anachronistic charm of the strip shines through, not least when our hapless fugitive clangs his way over a set of metal dustbins. Shock’d? : Pretty effective; the switch of the pursuer being the human is effectively masked by the pleading for humanity from the fugitive. It’s a very slight strip and not the first time Future Shocks have had a human-robot reverse as the reveal but it is still charmingly executed and is careful never to refer to the fugitive as a ‘man’ or ‘human’ before the shock is revealed. Plot: It is the 21st Century and a small boy wants to go outside his house, his father agrees provided he is accompanied by the large ‘Guardian’ robot. The robot, with long flexible arms, constantly refuses to let the boy engage in youthful japes, such as climbing an old tree, citing ‘Negative! High Danger Factor!‘ The Droid does agree to go through the old abandoned town on the basis that the mutant inhabitants only come out at night and that he is programmed to keep the boy within reach at all times. As they walk through the deserted sector the ground gives way and boy and robot crash into an underground passage. The boy starts to make his way up to the opening he has fallen through. 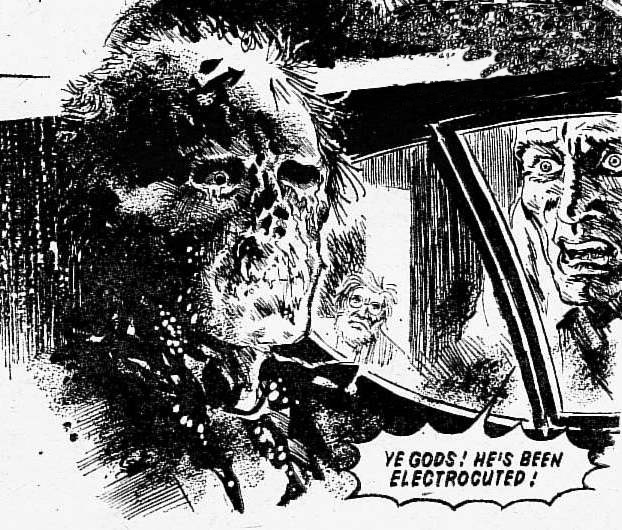 Thoughts: Mike Cruden, in the first of eight Future Shocks he would write for the Prog, delivers a Terror Tale before its time. The simple concept, that a trapped robot programmed never to let the child out of its proximity thus traps the child, is well executed and, importantly for what was still a kids comic, aimed directly at the reader. There is no name given to the child nor his father, in essence this is ‘every’ child, at least ‘every’ reader, and his simple wants for fun, climbing a tree, are the same as the readership. Up until this point Future Shocks had exclusively featured adult protagonists so Cruden deserves a lot of credit for thinking to connect with his audience. 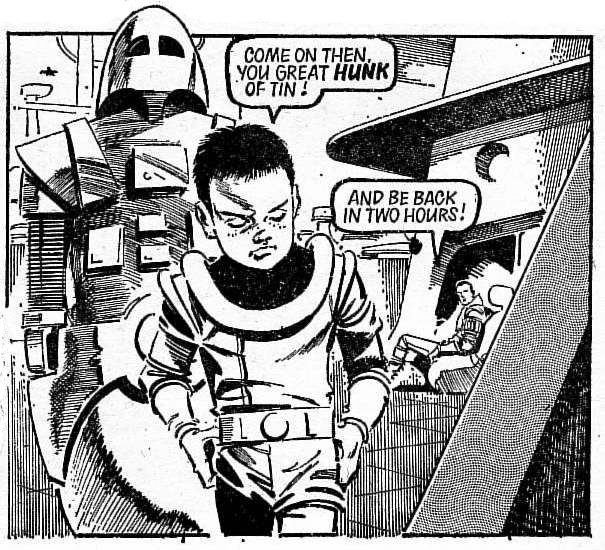 John Cooper, in his second shock in three issues, draws his usual 50’s Sci-Fi styling and a wonderfully grumpy thwarted kid who scowls his way through the entire strip. Every panel features his petulant unhappiness until, in out final view of him, his face is one of sheer terror and fixed with a look that ensures that, regardless of the reader’s age, there is a timeless pleasure in this bleak ending. Shock’d? There is no real shock in the tale, just a fantastically terrifying conclusion that must have kept more than one squaxx up at night.